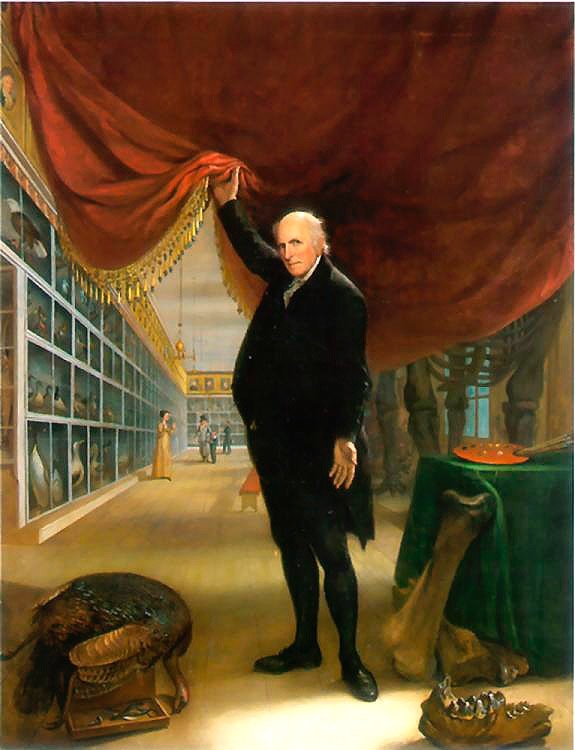 In the first fan girl crush blog about Charles Willson Peale, I talked about how Peale created the first American Museum. Today, I’m talking about the rest of his life. Part of the reason I admire Peale so much is that his attitude about life seemed to be, “I can figure that out.” If he admired a talent or a skill, he would figure out how to acquire that ability himself and work at it until he was at least proficient at the skill. At every turn, he taught what he knew to others, particularly his children. 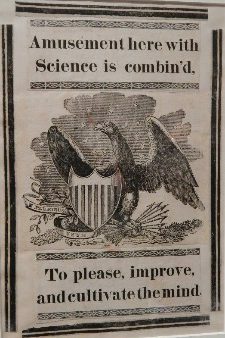 A contemporary of the founding fathers, Peale had the same zest for life and learning that Franklin and Jefferson exhibited. In fact, those three often exchanged correspondence discussing new inventions and sharing ideas on how to improve them. Until the very end of his life, Peale demonstrated this zeal for learning and a desire to share his knowledge with others. Peale was the son of a British convict who was banished to the colonies. The senior Peale moved to Annapolis and used his considerable smarts to become the headmaster of a prestigious school, where the Peale family lived and the Peale children attended the school for free. This fantastic opportunity meant that young Charles Willson Peale was exposed to many subjects that he wouldn’t normally get to experience, and he soon discovered that he loved drawing and painting, a love that stayed with him his entire life. 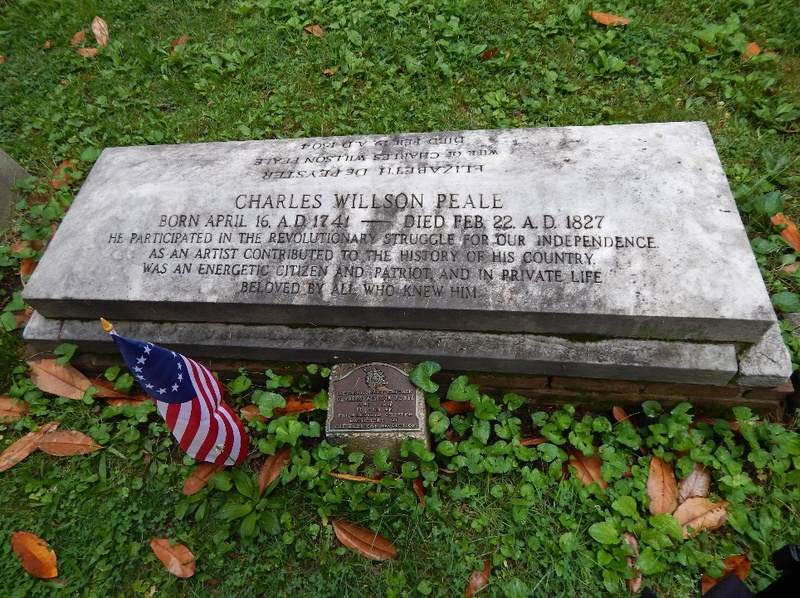 When the elder Peale died in 1750 at the age of 41 and the family was left destitute and homeless, an old student of elder Peale took the family in. Mrs. Peale became a dress maker to earn some money. Too young to work himself, Charles would help his mother by going to town to sketch the latest styles for her. At the ripe old age of 13, Charles and his mother decided it was time for him to earn a trade, so he was apprenticed off. The two of them discussed his options and Charles decided on saddlery. Saddlery was smelly and hard but Charles was so industrious that his master gave him extra jobs and he was actually able to save some money. His first big purchase was a pocket watch, but it stopped working almost immediately. He took it in for repair, paid a considerable sum and then the watch stopped again. So he decided to learn how watches work so he could fix it himself. This started his interest in tinkering. Portrait of Marquis de Lafayette by Charles Willson Peale. At 21, after considerable confusion, he was married to his first wife and the love of his life, Rachel. They lived with his mother while he was creating a successful business to compete with his former master. Unfortunately, he chose to establish his new business a little too close to his master, and to show his dissatisfaction, the old master offered to set Peale up in business by making him a loan on tools and leather. The friendly and trusting Peale took him up on his offer, only realizing the bad deal afterwards, which ended up being the cause of considerable financial troubles for years. While on a trip to Norfolk to buy more supplies, Peale visited a man whose oil paintings were so bad that Peale thought, “I can do better.” He had never actually seen an oil painting before this visit and had nothing to use for comparison. But that didn’t matter. He was now a painter. He immediately came back to Annapolis and painted portraits of Rachel, his brother James and himself. They were so good, he got several commissions. At this point, he added sign-making to his trade using the carriage oil paint. 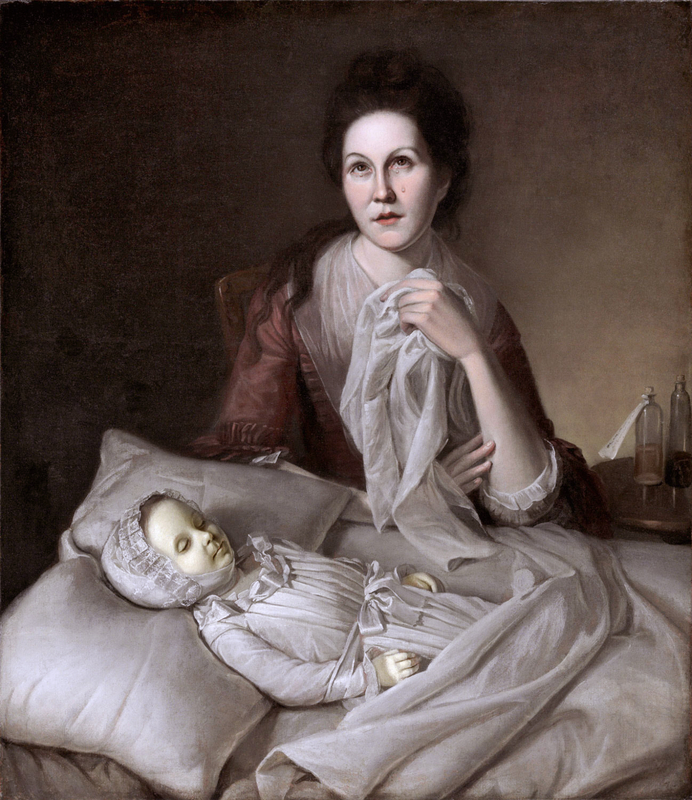 Charles Willson Peale’s wife Rachel, weeping over their daughter who died of smallpox. To continue with this new venture, he needed portrait supplies from Philadelphia. When he got to Philadelphia, Peale didn’t know how to actually paint so he couldn’t order pigments and supplies. Instead, he got a price list and said he’d come back. He then got a basic art instruction book (two volumes) from London and read that. With that new knowledge and his price list, he selected his supplies. He still had no practical knowledge, so he traded a saddle for lessons (stretching canvases, sizing a canvas, etc.) from a local artist. In 1764, Peale joined “The Sons of Freedom” and used his artistic ability to paint their protest signs. Because of this, all the financial troubles he incurred from his original master came back to bite him. The prominent men to whom he owed money were not happy with his involvement with these colonial rabble-rousers, and they were coming for him. It was either flee or rot in jail. So, leaving a very pregnant Rachel at home, he fled to his sisters’ home. From there, he ended up on a schooner that was making a short trip to Boston to deliver corn. Eighteen months and several adventures later, Peale had developed enough skills to stave off his debts and reunite with his beloved Rachel. Shortly thereafter, he had the opportunity to study art in London for the next year. While in London, Peale popped in on another colonist from Pennsylvania, Benjamin Franklin. This impromptu visit resulted in a great friendship that would last a lifetime. Upon returning to Pennsylvania, Peale spent the next several years building his reputation and earning commissions as a portrait painter. 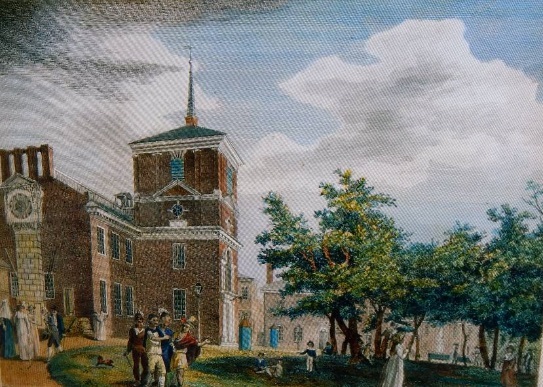 Independence Hall, formerly the Pennsylvania Statehouse, as painted by Charles Willson Peale. On July 8, 1776, Peale began his military career. He made the short walk from a newly-purchased home in Philadelphia to the statehouse to hear the Declaration of Independence being read. A month later, he joined the militia and was responsible for a group of 81 men. Before heading out to an unknown fate, Peale made the effort to check on the families of each of his 81 men, inquiring about concerns and needs while they would be away fighting. Although he and his men were not at battle long, this concern for his men continued throughout the war and did not go unappreciated by those he led. During the Battle of Princeton, Peale used saddlery skills to make moccasins for those without shoes. During the war, Peale painted portraits of various important figures. Among them was Gilbert du Motier, know as the Marquis de Lafayette. Lafayette was a key figure in the American Revolution. He was commissioned as a major general and was a friend and trusted advisor to General George Washington. 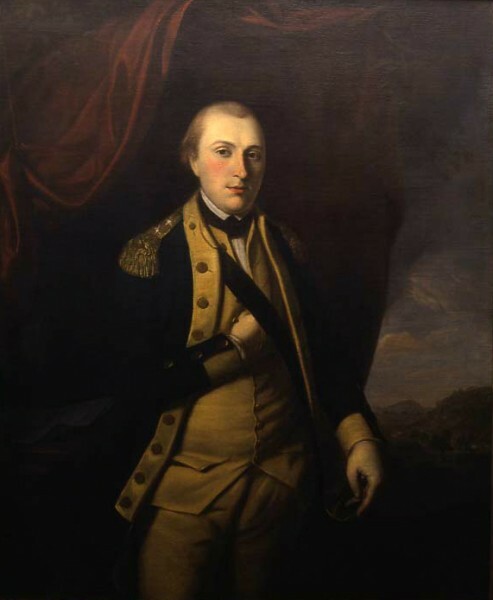 As Lafayette sat for his portrait, he and Peale became friends. 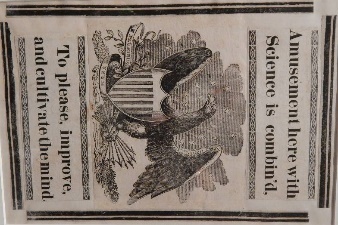 This pattern repeated with Washington, Jefferson, Madison and many other familiar names. Lord Cornwallis was defeated at Yorktown in 1781 which caused everyone to put candles in their windows. A young Frenchman removed two of the sashes in the windows and put up transparent pictures instead. Peale followed suit the next night and all the windows featured portraits of leaders of Yorktown. People came from all over town to see the display, which he changed out several more times. This provided a wider audience than his wealthy patrons and helped those who’d turned their back on Peale for political reasons to notice him again. This also began Peale’s career as a showman. Before, during and after the war, Peale painted portraits of various sizes, and a year after the Battle of Yorktown, Peale added an addition onto his house to hold them all. This was the first public picture gallery in America. The portraits were of the heroes of the revolution. Included in the gallery were full-length portraits of Washington and Gerard to smaller portraits of Lafayette, Baron von Steuben, Thomas Paine, and Robert Morris. He charged no admission fee because he wanted commissions for copies but also because he wanted to inspire his fellow citizens to live up to the highest ideals of a republican form of government. 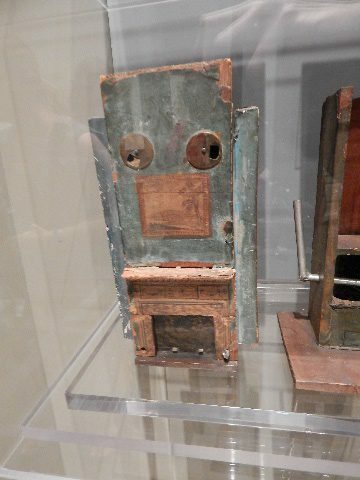 Model of Peale’s patented fireplace. The next few years were busy. First, the portrait gallery transformed into a gallery for moving pictures, and then later became the precursor to the first natural history museum. In 1804, Peale returned to painting again, which led to the founding the Pennsylvania Academy of Fine Arts. Peale received two patents and subsequently spent a great deal of time copying out the documents for others. To save time, he perfected the polygraph, which allowed the writer to pen two documents at once. 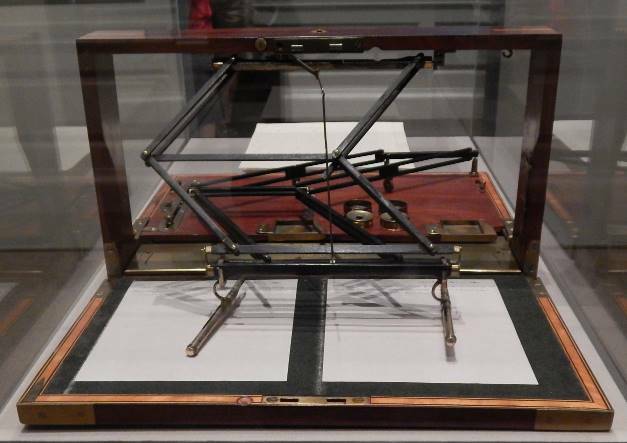 Peale is credited with patenting improvements to the original polygraph machine, which had nothing to do with truth-telling. A writer would pen a document on one side, and the machine would replicate the hand movements on the other. In 1810, Peale decided to retire to a farm, and by retire he meant totally re-do. He added a studio, redid the kitchen, planted crops, and repaired the farm tools. Peale was too fond of his livestock to slaughter them. He needed money, so his neighbor suggested currants for wine, which he planted reluctantly because he himself was not a drinker. The wine became the most profitable project at the farm and was highly praised. During this time, Peale and Thomas Jefferson kept up a steady exchange of letters discussing new agricultural methods and equipment. 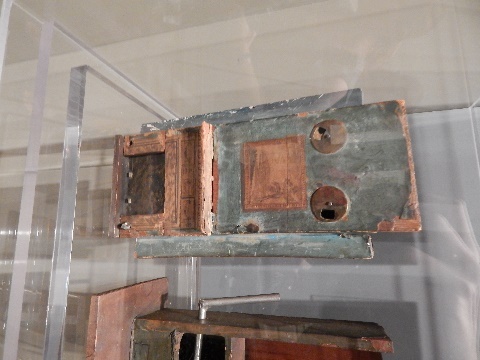 At Monticello, Jefferson invented the moldboard plow and Peale put it into service at Belfield. While Peale enjoyed tinkering with the farm equipment, he didn’t actually like the farming. In fact, farming may be the only thing at which Peale never truly excelled. Not to worry, however. His son Rubens loved botany, so he applied his artistic eye to this arena and created a lavish garden. The beauty of the gardens attracted flocks of people, so many in fact that the family had to close the gates to keep people from crushing the flowers. Rather than producing crops, Peale produced landscape paintings. In the end, Peale discovered that “retirement was hard on the wallet.” For a number of reasons, Belfield was sold, and Peale returned to Philly to focus on the future of his museum. A few years later, the Marquis de Lafayette, a Revolutionary War hero, returned to Philadelphia for a visit. The red carpets were rolled out. There was to be a parade and a public gathering, but Peale was not asked to play any role in the visit. While this wounded his pride, he came to cheer in the crowd nonetheless. During the processional parade to the statehouse, however, Lafayette spied Peale in the crowd and immediately left the formal gathering and went to embrace his old friend. He insisted that Peale join him for several of the planned events as his special guest. As he got older, his children believed that he had obtained a certain position in Philly society and they didn’t want him to jeopardize this. They became extremely nervous when he decided to write his autobiography in his mid-80’s. One of his daughters Sophy would read the installments nightly and would try to censor the more provocative parts. His kids were horrified when Peale put out an announcement in May of 1826 for his newest venture — Porcelain False Teeth, selling for $150 a set. At the age of 85, Peale decided to find a fourth Mrs. Peale and marry again. A friend recommended an elderly lady who taught at a school for the deaf in New York. After a whirlwind two-week romance, Peale proposed to this lucky lady. The proposal also included an offer to teach her how to make false teeth. Shockingly, neither offer was accepted. Peale returned to Philly from this adventure by boat, but it ran aground in stormy weather about a mile from the dock, so he had to walk with his luggage in the rain for quite some distance. When he arrived home, he was exhausted and had “strained his heart.” He became increasingly weak over the next few weeks and died in his bed Feb. 22, 1827. He was buried in St. Peter’s Churchyard in Philadelphia, just blocks from his beloved museum. The Houston Museum of Natural Science is opening a Peale-like Cabinet of Curiosities next Friday, May 6. Come visit for a taste of the wonder Americans might have felt wandering through Peale’s museum. Thank you, Nicole! Kudos for a this Interesting portrayal of the complex nature of C W Peale. He is my 3rd great grandfather, and I have always admired his talent, creativity, and zest for knowledge.